So I’ve been a bad girl, and I didn’t update my blog yesterday, which means I’m bursting to get tons of cool stuff off my chest. The last two days have been insane. Let’s start with what blew my mind the most. THE ENTIRE AVENGERS CAST WAS REVEALED! 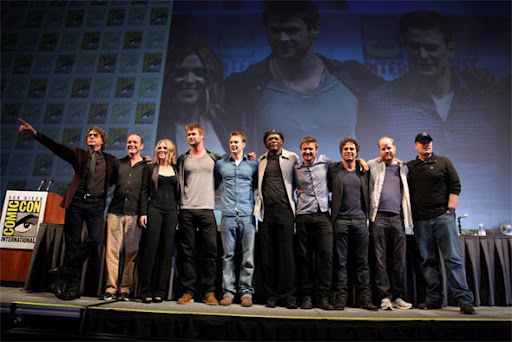 Not only was the cast revealed, but everyone showed up, along with the film’s writer/director Joss Whedon. I kid you not, I had geek chills. I lost my voice screaming. So the big reveal everyone’s been waiting for: The Hulk will be played by Mark Ruffalo. And surprise! Jeremy Renner will play Hawkeye. I have the highest hopes for The Avengers movie. It would be difficult for most writers and directors to juggle so many strong characters and actors at one time, but Whedon has experience doing exactly that with Firefly and Serenity. And I can’t wait for him to write some snarky lines for Tony Stark (snarky wit is another of Whedon’s specialties). I think he’s going to blow people away. The highlight of the Green Lantern panel, believe it or not, was not the film footage (which was short and didn’t show much– it didn’t even show the suit). 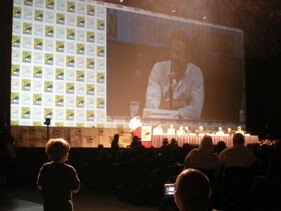 In fact, the highlight was when a young fan asked Reynolds to recite the Green Lantern oath, which he had refused to do on many other occasions. You could see the kid brighten up and renew his love for comic book heroes as Reynolds said the lines in his best heroic voice. 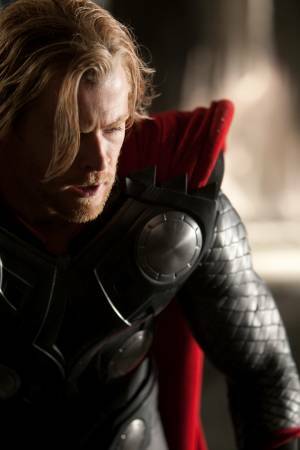 Unlike the Green Lantern panel, the Thor panel showed a lot of polished footage. Visually, it looks great. The color palette, set design, and other-world feel was done well. Plus, I’m a sucker for Natalie Portman. What geek isn’t? 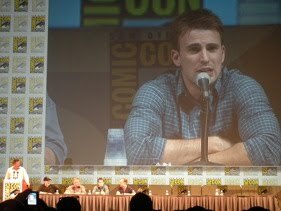 The Captain America footage was more like a teaser. It’s definitely going to be his origin story, set during WW II. What we saw, clearly showed what Marvel has already hinted at– that they’re carefully interweaving all their different characters into one universe, which isn’t an easy thing to do. The stories overlap slightly, and all the characters exist on the same plane, culminating in the big movie everyone’s waiting for– the Avengers. Pretty effing cool. As a side note, there was a stabbing in Hall H today while I was there. It was pretty crazy. I guess a fan got into a scuffle and stabbed someone in the eye over a seat. The whole thing was so unexpected. Nothing like that has ever happened at Comic-Con. Geeks are such a peaceful people. Well, besides the stabbing, THAT IS SO COOL!! I'm SO excited to see the Avengers. I'm glad that you're there so I can live vicariously through you.